Today, Egyptian Mohamed Salah has looked very good as he trained with Liverpool's first team. 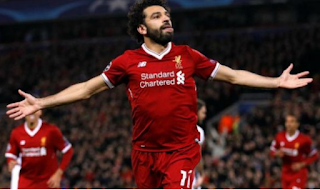 Salah was away after winning 3-0 Reds against City in the Champions League's first quarter-finals while complaining of an injury in the second half of the match. He was fired during the derby with Everton in England but in the match at Etihad, it seems that Salah will be ready. Salah has scored 38 goals in 41 appearances after his arrival at Merseyside from Rome as well as 13 assists. Klopp also had good news about his return to defense. He has said that Andreas Robertson and Alberto Moreno have been joined by Salah in training and who missed the match against Everton. This means that in the second match of the quarter-finals Liverpool misses Emre Can, Joel Matip and Joe Gomez. Jordan Henderson is added to the list of shortages because of the suspension. The Reds are in a good position to reach the semifinals for the first time in 10 years.